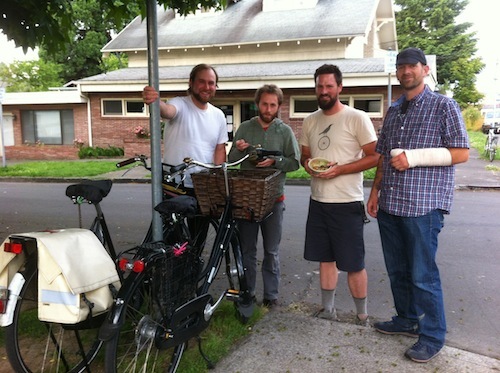 We met with Travis Wittwer & Dave Feucht of TRANSPORTland over soup and beer at Dave’s place to discuss cargo bikes, the Disaster Relief Trials event yesterday, transit and bicycle integration, improving the infrastructure or culture of bicycling, and many other things. Powered byHopworks’ hefeweizen and 7 grain stout beers! Tour de Clack is coming, led by our friend and former guest Matt Picio! Tour de Clack is an inaugural bike ride in rural Clackamas County on July 7 2012. It’s free, and to draw attention to water quality projects done by the ride’s sponsor, the Clackamas River Basin Council (CRBC).